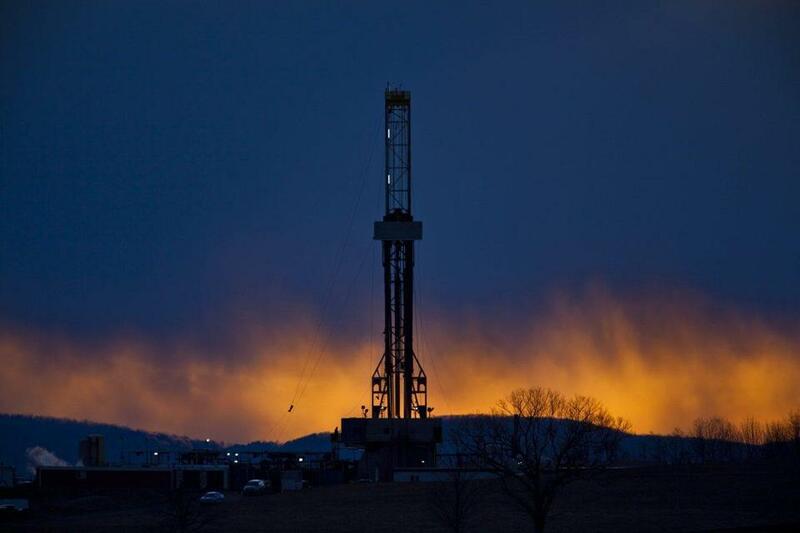 A hydraulic fracturing drill rig is shown in Tunkhannock, Pa. Though controversial, fracking has created jobs in some areas. A proposal to expand a major local pipeline could bring cheap, plentiful supplies of natural gas to New England from Northeast shale formations, but it also thrusts the region into a raging debate that pits economics against environment, industry against community, and sometimes neighbor against neighbor. The focus is often on a controversial technique, known as fracking, that pumps chemical-laced, pressurized water deep into the earth to unlock natural gas trapped by shale rock. The technology has helped bring jobs, businesses, and money to poorer communities that desperately need it in places like western Pennsylvania. But drilling has also disrupted rural ways of life and been blamed for polluting air and water. In Dimock, Pa., a community of about 1,400 in the Susquehanna River Valley, Julie and Craig Sautner have been forced to truck water to their 3.7-acre property for more than three years, since their well became polluted with methane, iron, uranium, aluminum, and other substances. They blame it on nearby gas drilling. The opening of shale gas fields in recent years has changed the energy equation for the United States, providing cheap supplies to feed its hunger for energy. Natural gas prices are at their lowest point in a decade, contributing to lower heating and electricity bills, and supporting the nation’s recovery. For New England, the proximity to abundant natural gas in the Northeast could reduce one of the greatest disadvantages for the region’s economy: high energy costs. The Marcellus, a shale formation stretching beneath a half-dozen Northeastern states, including Pennsylvania and New York, is estimated to hold nearly one-third of the nation’s shale gas reserves. Environmental concerns often center around the drilling process. One particular technique, called hydraulic fracturing - the formal name for fracking - has become the flashpoint for protesters. It uses large amounts of pressurized water, mixed with sand and a cocktail of chemicals, to crack densely-packed shale rock to release trapped gas. The water, and later the gas, must travel thousands of feet in cement- and steel-encased wells, and through the water table to the surface. If these wells are not constructed or operated properly, chemicals and gas can seep into groundwater or escape into the air. At Craig Sautner’s home, drinking water from his well tarnished silverware and left laundry with a funny smell. It sometimes made his family woozy or caused rashes. A YouTube video, posted last month, shows him lighting a jug of the water on fire. “They keep on saying there’s nothing wrong with the water,’’ he said. Industry has struggled against such perceptions. In an effort to be more transparent, many companies are disclosing the chemicals used in fracking on websites like FracFocus.org. Some communities welcome drilling. In Lycoming County, Pa., which includes South Williamsport, home of the Little League World Series, the economy has boomed in the past three or four years, with drilling helping to bring an estimated 2,000 jobs, said Vincent Matteo, head of the Williamsport/Lycoming Chamber of Commerce. In that same period, more than 100 new businesses opened, including hotels, to serve the influx of workers from gas production companies such as Anadarko Petroleum Corp. of Houston and Range Resources Corp. of Fort Worth. In 2010, the most recent year available, Williamsport was the seventh fastest growing metropolitan area in the nation, according to the US Department of Commerce. Last year, the county’s average annual unemployment rate dropped more than a percentage point to 7.7 percent. Many communities, however, remain divided over drilling. In Milanville, Pa., a community of about 500 along the Delaware River, the debate has created rifts among longtime neighbors, many of whose families have owned their properties since they were granted by the state’s founder, William Penn. Some see drilling as a way to cash in, others worry it will disrupt their lives and ruin the environment. Only test wells have been drilled in the area, but tensions are rising, said Grady Avant, a Milanville resident and fracking opponent. In Dryden, N.Y., a town inhabited by dairy farmers and commuters to Cornell University in Ithaca, a drilling ban was instituted last year after local leaders decided the community wasn’t prepared for changes the gas industry might bring - especially after witnessing the impact in Pennsylvania communities. Such debates are only expected to continue as state, local, and national policy makers work to balance the benefits of cheap, abundant energy against the risks to air, water, and community. The Environmental Protection Agency has been in the middle of those difficult negotiations, and earlier this month announced new rules designed to cut harmful gases released through fracking by 95 percent, while also giving the drilling industry a grace period until 2015 to develop the technology needed to meet the new emissions goal. Both environmentalists and industry offered praise for the balance struck in the new rules. Some shale gas is already making its way into New England to heat homes, power factories, and generate electricity. More is likely to come. As it does, lawmakers, policy makers, and environmental advocates say the region can’t ignore the debate over drilling and its impact.